A Thought Experiment: "Let there be light..."
Of course, energy ranks first on the hierarchy of needs. Accordingly, the foremost concern for an asteroidal habitat is energy supply for the builders. Of course, initial builders will be Artificial Intelligence (AI) devices such as robots and nanobots. AI devices are impervious to the onerous conditions that would devastate humans (lack of water, low temperature, radiation, microgravity, to name a few). They don't need to rest, and they don't originate human error. Thus, AI devices will be the first occupants on the first few asteroids destined to become space habitats for signiificant numbers of humans. Therefore, we'll need Artificial Intelligence (AI) devices, (robots, nanobots, etc.) to do most of the work required to process asteroidal materials into a shell. Initial construction of the first few habitats will take years to transform raw materials into a a habitat which can provide reasonable acommodations to humans. These tasks are discussed in depth in other blentries, but these tasks will mostly be done by AI devices. They can be monitored and remotely controlled, but since time lags for communications will be constrained by huge distances, these devices will need a certain amoount of automony. ENERGY NEEDS. These deployed devices to the NEO will need an inexhaustible, consistent supply of energy. Prior to access from solar energy, AI devices will need to use deployed nuclear energy. Nuclear energy can last a long time, but there'll be limitations; these limitations will be easily overcome with solar supplements and eventually solar replacements. Of course, first task will be to collect minerals from asteroid and start building solar mirror and solar arrays.Subsequent to shell completion, habitat's agriculture as well as extensive flora/fauna will need a consistent source of light. As long as habitats are reasonably close to a star, mirrors will be a good way to collect and distribute light. Gerald O'Neill describes some ingenious ways to deploy and use mirrors about such habitats. 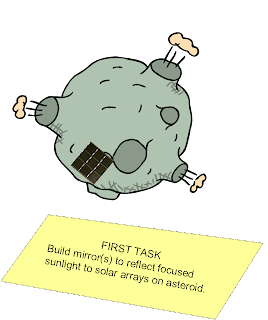 FIRST, payload of AI devices and a nuclear reactor will gently load on a selected asteroid. As much as possible, these devices will be monitored and controlled from human operators on Earth. It will be impractical to expect continuous contact (due to Earth's rotation and even more so due to asteriodal orbit which will take it long distances away for long periods of time); thus, AI devices will need considerable autonomy. It's possible that human intervention can be supplemented by spaceborne humans. 2ND, AI devices will accomplish considerable time and effort assaying asteroid samples to determine what minerals are available. Hopefully, these minerals will help AI devices manufacture spare parts for themselves and possible even other AI devices. 3RD, hopefully more payloads will arrive to this asteroid. Contents to be determined, but I'd guess more AI devices, and possible minerals determined not to be available at this asteroid. Eventually, we'd want to import needed minerals from other asteroids NOT Earth or other planets/moons. 4TH, start manufacturing solar mirrors and solar arrays for long term energy needs. 5TH, deploy mirror and arrays. Until this point, all energy consumptions must be replenished by nuclear reactor. Note following references to Gerard O'Neill's classic book: THE HIGH FRONTIER, HUMAN COLONIES IN SPACE. As always, content is fron the original authors, misrakes are mine. Page 26. On Earth, solar power is attenuated by the atmosphere, uncertain due to weather and cut off every night by Earth's rotation. In free space at 1.0 AU from Sol, average solar energy is available full time at 1.4 kilowatts per square meter, almost ten times higher than average solar energy which reaches Earth's surface. P. 32-34. It's very likely that solar power will always be cheaper then nuclear power (either fission or fusion). First, to supply heat in space, a simple mirror with no moving parts can locate at the point of use and supply direct heat (i.e., not have to convert via different forms to energy). Near zero gravity will facilitate manufacture of mirrors in space. Heat material to high temps w/o contamination of confining crucbile walls, form uniform mixtures of heavy and light materials, grow large single crystal, Gentle rotation can maintain very thin surfaces accurately in form of clyinders and cones which may especially useful to make large mirrors made of thin foil. p. 43 Directly used heat may be obtained from solar power without going through an intermediate stage such as electricity. Even at nighttime, solar powers will always be available, no more the a few feet from the house floor. Reflected by external mirrors, solar heat for cooking can come up through the floor, a window and through a short channel to absorb on the lower side of simple metal cooking surface. 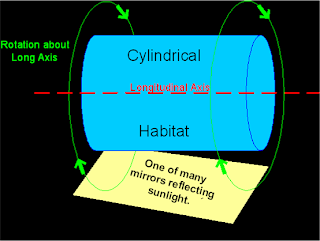 p. 45 To simulate gravity for the humans inhabiting the habitat, they should live on inside of outside cylindrical hull, and the cylindrical habitat should roate about the longitudinal axis as shown. As long as the mass stays constant, the law of conservation of angular momentum should keep continue this this spin in both magnitude and direction. Thus, we'll have a gyroscope with a long axis pointing in same direction regardless of position in orbit. Thus, if the habitat's longitudinal axis points toward Sagittarius constellation (which happens to be in the same direction as the center of our galaxy, Milky Way), then the habitat will continue pointing to Sagitarius as it orbits Sol, our star. Therefore, different parts of the the habitat will face Sol at different positions in the habitat's orbit around the Sun. In one position, the habitat's tail will face Sol, 3 months later, the left side will face Sol, the next quarter, the front will face Sol, the fourth quarter, the right side. This constantly changing position means the sunlight will hit the habitat and its mirror(s) at different angles throughout the orbit. 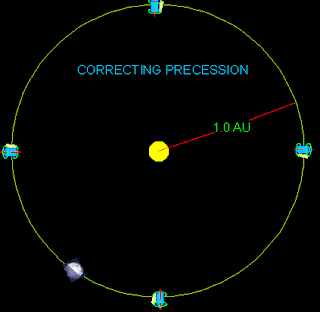 One solution to this "precession" problem is to orient the habitat's cylinder axis perpendicular to the habitat's orbit around the sun and to provide a lightweight mirror angled at 45 degress to bring sunshine along that axis. This will ensure sunshine arrives in direction along the cylinder axis. 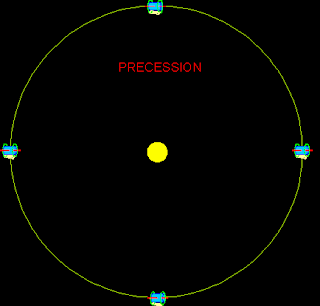 In CORRECTING PRECESSION figure, same four positions of habitat are shown (a not to scale Earth is shown to idicate that the habitat can share the Earth's orbit if we choose). However, habitat's orientation differs from previous figure in that the long axis of each postion changes to point directly at Sun. To do this, requires adjusting long axis direction about about 1 degree per day. O'Neill suggests a way to do this in his book. p. 69 L5 is a famous Lagrangian position with respect to Earth and the Sun (there are other Lagrangian points with respect to other two body systems, such as Earth and Luna). It turns out there are multiple L5 positions for habitats to locate, as a matter of fact there might be a multitude of such positions. There are many construction efficiencies at these L5 points and they all depend on constant, dependable solar power. p. 71 Solar cell array will be much lighter then nuclear plan with same power capacity. p. 74 Add solar cells as need increases. p. 77 Asteroidal resources can provide metals and silicon for solar cell arrays. p. 82-86 Satellite Solar Power Stations (SSPS) will locate in geosynchronous orbit above a fixed point on Earth's surface, a large solar power station. At the orbiting station, solar electric power would convert to microwve energy wheich would travel via a narrow beam to a fixed antenna on the ground. p. 93 On Luna, a solar power station could locate on a mountain peak at the lunar north or south pole where sunshine would be available fulltime. A transmission line from the pole to the desired location on the lunar surface would allow fulltime operation. p. 102 It's possible that some interplanetary spacecraft could have engines powered by extensive solar cell arrays like sails on a square rigger. These sails would streech out for several kilometers, but that could easily work for vessels never intended to enter an atmosphere. p. 115 Need for cheap energy on Earth's surface in form of electricity via microwaves from orbiting SSPS is likely to exist for a long time. p. 130-132 An unlimited energy source can be designed with the envrionment in mind. perhpas the largest envrionment impact will come from the constructon of the solar panel photovoltaics because of the toxic waste by products. Producing this energy source in space will help decrease or possibly eliminiate this environmental impact. ---meet applicable international safety standards. ---be economically viable as global energy supply system. ---comply with international legal and regulatory framework for space operations. Much of following material has been extracted from Wikipedia’s article (http://en.wikipedia.org/wiki/Space_colonization). As always credit for content must go to the original authors, misrakes are all mine. Solar energy in orbit is abundant, reliable, and powers satellites today. There is no night in space, and no clouds or atmosphere to block sunlight. The solar energy available, in watts per square meter, at any distance, d, from the Sun can be calculated by the formula E = 1366/d², where d is measured in astronomical units. Energy has been suggested as an eventual export item for space settlements, perhaps using microwave beams to send power to Earth or the Moon. This method may have significant drawbacks related to the large area that may be necessary for transmitted energy to be extracted on earth. The Moon has nights of two Earth weeks in duration and Mars has night, dust, and is farther from the Sun, reducing solar energy available by a factor of about 1/2-1/3, and possibly making nuclear power more attractive on these bodies. Extending this problem to habitats; some habitats may find themselves in highly eccentric orbits (aka "cyclers) or even in interstellar travel (see "migrators") where sunlight will be greatly reduced. This will make nuclear power even more essential.